Chalkboard Slate Counter Top – I had heard of folks using chalk board slate, and heard that The RE Store gets some on occasion. I wanted a more contemporary look, and with our main colors being reds and black (floor, tub apron, end wall tile, etc.) – so chalk board was perfect. I also liked the thinness of the material. So often I think thick stone counters are wasteful, as only the top surface is what is important. Fortunately I was able to find a piece slightly larger than the size I needed, and I also got a great deal from a fabricator who has worked on many of my design projects, who cut the shape to my template, and honed the top surface. The finished look is clean and elegant. Bed headboard – We got a bed from a neighbor who wanted to get a new Queen-size bed. When we set it up we realized the mattresses were not very comfortable, so we ended up buying a new set. With only the metal frame, we needed a headboard, and after designing one, and getting an estimate from a cabinet-maker I know, I decided to look at other options, as this was going to cost $200-300; the material alone $125+. I decided a trip to The RE Store might give me some ideas, and/or I might find some material to use, saving some money. I did not find any sheet-stock material that looked appropriate, but did start looking at the various doors hoping to find something interesting. Luckily I spotted a great mahogany door, though well longer than the 5′ headboard length I needed. For $40 I decided to buy the door and figure out how to modify this later. As an architect I’ve come to know a lot of great craftspeople, and happen to be working with one on a project of his, so we worked out a trade. He shortened the door; removing the recessed panel, cutting down the stiles, and reset it all so perfectly; even filling in the former hardware holes. We love the headboard and even seeing the hardware fillers, gives us a sense of all the work that went into the door. Interior window – I have used interior re-lites in many projects, and finally decided to install one between a south-facing upstairs bedroom and our stairway. In conjunction with re-surfacing the original plaster walls, which had some cracking, and also wanting to add some texture to the walls (in this case a soft broom texture, recommended by our plaster contractor). I found a beautiful leaded window, that had been removed from a house in South Park, due to window upgrades in that area, for better acoustic benefits of double-paned windows. An added benefit is that the bedroom feels even larger with the interior window, and still has all the privacy as no one can see into the room through the re-lite. Garden gates – I took another trip to The RE Store to see what I could get inspired by, when I needed to install a garden gate that would keep in our friend’s dog, for all the times we dog-sit. 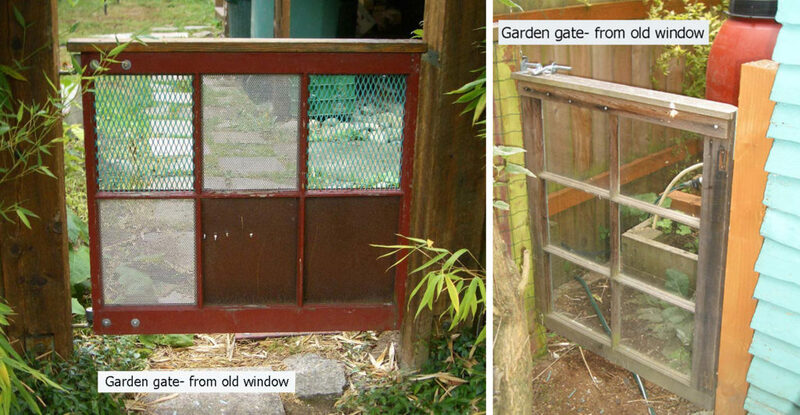 I spotted some window sashes, and figured those would make some nice gate, and provide some see-through for pets and children. I was worried about keeping the glass in, for the main gate, along our side street, and after finding a nice window sash, removed the glass and installed some scrap metal that I had around waiting to be repurposed. I then painted the gate similar colors to the house (paint was on-hand), with a clear, salvaged fir top.